Hull is one of the largest settlements in East Yorkshire, but remains isolated from main transportation routes. In addition, the city itself lacks cohesion. Both factors will mitigate against the city's regeneration unless solutions are found to these challenges. Our 10 year Strategic Framework reinforces the underlying character of the city, seeking to heal the wounds in the existing urban fabric, rather than proposing radical structural change. It recognises the main areas of particular urban character and economic activity and suggests how these can be enhanced. It also identifies further areas, which have suffered serious physical and economic decay, and proposes new uses for them, which will strengthen the centre as a whole. It places considerable emphasis on the need to improve the linkages between all areas. 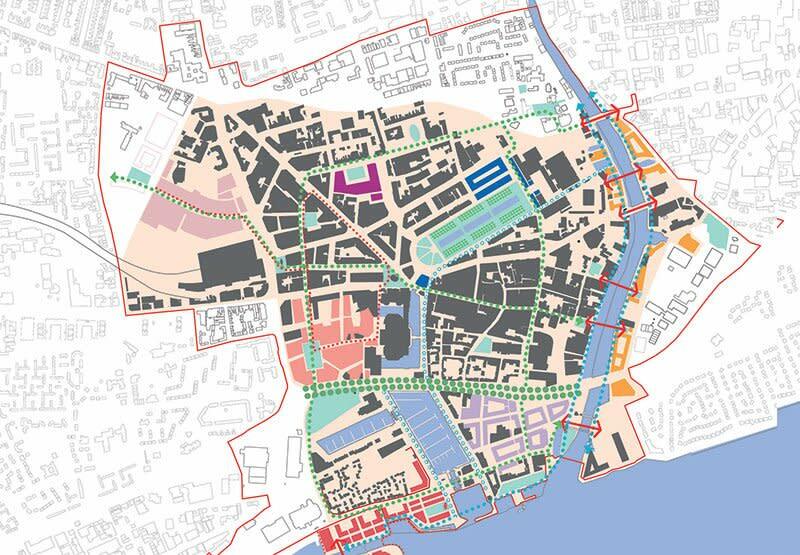 Key elements of the Framework have been the reinforcement of the historic street pattern, stitching back together peripheral urban fabric with the core of the city centre and making the most of the opportunity of the relationship between the city, the river and the historic dockside.